← 4th of July Fireworks Apps – (but don’t forget the ear muffs)! My search for new iPad 3 cases found a number of bounce-able ones suited to toddlers and preschool children. In the post “How to Choose an iPad Cover”, another factor suggested to consider is the content of the material of the case. Is it made of unsafe silicon material (those made in China?)? Here are some of the tried and true cases now updated for use with iPad 3 as well as new cases recently debuted that are designed for toddler to preschool children. As there are few reviews of this category of cases, I included consumer ratings from Amazon, the largest store in the world. The numbers of the customer who rated may be dependent on just the sales of a single colored case and should be taken into consideration. More information can be found on Amazon on the ratings. Review of the type of materials used in the cases are listed with exception of the Fisher Price case. Despite a search of the material make up of the Fisher Price case on the Internet and on their website, I could not find a description of the materials used. 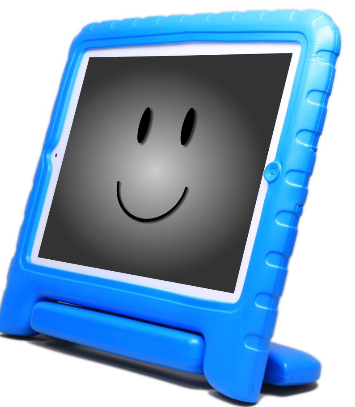 Fisher-Price Laugh and Learn Apptivity Case: iPad Edition $34.95. Compatible (per Fisher Prices web site) as compatible with iPad 1, 2 and 3. No description of material content provided on Amazon or Fisher Price website. Made in China. Rated 4/5 on 8 customer views. Speck SPK-A1247 iGuy for iPad 3 – Lime $27.85 Fits all iPad cases including iPad 2 and 3. Made of light weight EVA foam. Free standing. 5/5 rating from 4 customers. 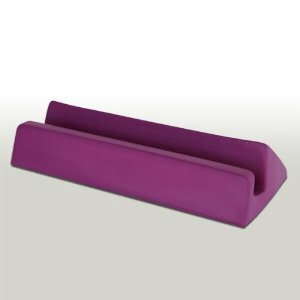 Big Grips Frame for iPad 2 | 3rd Generation – Purple $34.95 – Foam frame that is Phthalate and PVC free, lead and latex free. Lightweight, durable easy to clean and resistant to oils, chemicals, stains, molds and germs. Comfortable grip. Stand sold separately. Rated 5/5 from 7 customers. AddyCase for Home Button Blocking! 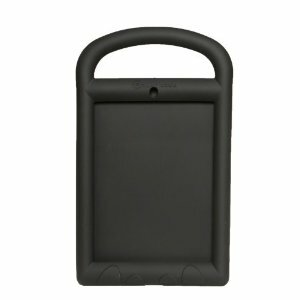 (Black) $49.00 Compatible with iPad 2 and 3. Easy to clean, non-toxic, lead free, latex free material. Provides handle and covers the home button to control users access to other apps. Resistant to oils, chemicals, stains, molds and germs. Rated 5/5 from 2 consumers. Our school’s 4K iPads have used the iGuy cases with positive responses from the teachers. What has been your experience with cases for young children? There are some varying opinions about blocking the home buttons to provide users the freedom and experience exploration and control. What are your thoughts? This entry was posted in Accessories, Early Childhood, iPad, iPad Management, iPod/iPad Accessory, Pediatrics and tagged accessories, iPad, iPad accessories. Bookmark the permalink. Omg They looks so cute and funny! i want to buy one! The kids cases are fun!